Kristín Dóra is a visual artist studying at the Iceland Academy of the Arts. She recently returned from an exchange program in Sweden, garnering attention for her outspoken window art. Her pieces are interesting takes on social matters and she is a spokesperson for self love. 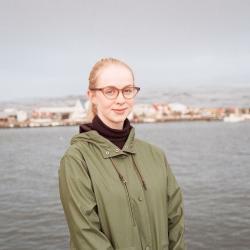 This summer she is working with two other girls in a project they call ‘Málglaðar’, in which they speak openly about body positivity and self confidence. I started creating stuff as a teenager just for the fun of it but I don’t really show that to anyone. When I was twenty years old and realized I could get an education in something fun I really started creating. There are plenty of lawyers and engineers in Iceland. I can be of more use by creating something interesting. I always start with words. My notebooks fill up pretty fast because I try to write down everything that goes on in my mind. There you can find all my secrets. My works tend to be about my own insecurities and the boys I have a crush on. Or something in society that I find important. The best of both worlds I guess. 19th century medical books, teenage angst, gardening, social media, love in all forms, poetry that makes me cry and coffee that dries my tears. I really like art that is vulnerable and funny. My favourite artist right now is David Shrigley, his stuff inspires me a lot. He’s real. I like stuff that hits me in the feelings but makes me laugh at the same time. His drawings with text are my favourite right now. My favourite artwork by myself is probably when I published my diary after one hectic year in the dating department. Having my parents read it at the exhibition definitely made me feel exposed. It’s fun! It can be limiting at times but then you just leave for a while, learn new things and come back. I spent last semester in Gothenburg, Sweden, which was really good for my art and me. I am excited for my last year in Iceland Academy of the Arts, though—the school is full of talented artists. What do you wish to achieve through your art? It would be great if people could get something out of it or simply enjoy it. People who like it, sometimes buy it and then I can splurge on good coffee. I try to make art that is accessible and human. It is a good way to keep a dialogue going on in society. Because I work with words I am demanding the time it takes to read the piece from the viewer, which I hope isn’t too bossy of me. I want to work in Iceland with an occasional trip to a new city, and learn new languages. If someone wants to marry me and have kids I might do that. I also really want to buy a house. Anyways, it will all figure itself out in the end. I’ll just keep on doing my thing.